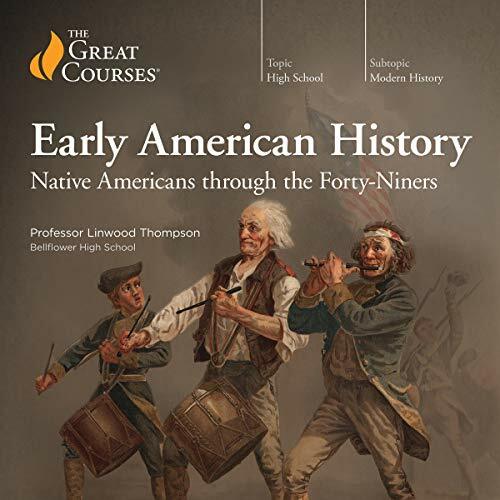 Make American history come alive for your student with these 30 excellent lectures that cover the first half of America's fascinating history from the settlement of the continent by Native Americans through to the California Gold Rush of 1849. Crafted with unusual creativity and innovation, each lecture is "taught" by a particular character. Professor Thompson "becomes" a Viking explorer, Christopher Columbus, revolutionary war foot soldiers, a French trapper, and a host of other characters who provide a first-person perspective on early American history. Students will learn the differences between Southwest and Eastern Woodland Native Americans; what led Europeans such as Columbus to the New World; the roles European powers - Spain, England, France, and the Netherlands - played in their colonies and how those colonies interacted; the struggles and farsightedness of Founding Fathers Jefferson, Hamilton, Franklin, and others in the creation of this new nation; how canals and railroads accelerated the expansion West; and so much more. "American history is a rich story of the events that have shaped modern American society,” notes Professor Thompson. “Allow the stories to transport you back in time to the initial shaping of a nation with diverse cultural roots. I love American history! I hope you will love it too."